With the sun finally making an appearance this spring, it may be time to drag out your bicycle from storage and take a spin around the neighborhood. But before you do that, there may be a few things to consider before heading off for a ride. A correct bike fit can prevent injury, keep an old one in check, and make your ride more enjoyable. Professional cyclists have their fit on a bike scrutinized in order to enhance their performance, but even recreational riders can benefit from having a few basic elements in mind. First, let’s talk about your seat and seat height. Your seat or “saddle” should always be level, not to make your hips tilt very far forward or back. Too far forward and too much pressure is put into your hands and arms, too far back and your low back may feel increased strain. In order to measure proper seat height, stand next to your bicycle and see where the seat hits on your body, a good starting point for correct height is about hip level. From there, while pedaling, your knee should remain slightly bent at the bottom of your pedal stroke (when your foot is closest to the ground). A rider should never feel like they must reach too far to pedal, causing excessive hip rocking, or feel their knees up near hip level if the seat is too low. Secondly, while riding, avoid putting undue pressure through your hands while gripping the bars. Too much compression can cause feelings of numbness and tingling in the fingers. To avoid this, change your hand position regularly on the handlebars and focus on pushing through your feet as you pedal. Doing this should decrease the amount of pressure being put through your hands, sending the force through your legs and making you more comfortable. Another aspect to consider which may affect your upper body comfort while riding is the reach from the seat to the handlebars. This comes down to selecting a frame size that fits your body height and bike style that suits your needs (comfort vs. performance vs. trail riding vs. road riding). Reaching too far forward can cause elevated shoulders and increased neck extension, which can cause pain. Finally, just some food for thought, bike helmets are not just for kids! According to the CDC, riders who wear a helmet reduce their risk of head trauma related injury by 80%. For a skilled rider, bicycling itself is not an inherently dangerous activity, but when riders take into account the number of uncontrollable variables, such as cars and other moving objects, the risk does increase. A helmet should be worn level on the head with the internal tightening mechanisms adjusted for a snug fit. An easy test is to push the helmet back from your forehead towards the back of your head, with a correct fit, the helmet should not slide back more than 1 inch. Most importantly, have fun! Bicycle riding is a great way to increase fitness, run errands, and enjoy nice weather. If you have any questions about your bike fit, contact a local bike shop, often times they will be able to dial in any adjustments that you may need. 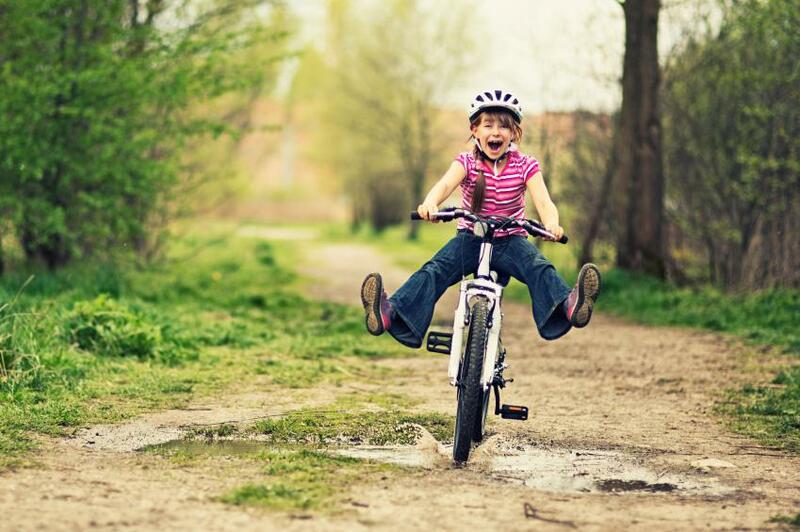 A comfortable bike, is a fun bike to ride! Written by Kathryn Cook, PTA, BS at Lafayette Physical Therapy.